Trayvon Martin’s death marks one of the most significant moments in the history of the hooded sweatshirt (henceforth referred to as a hoodie). The hoodie has been made to seem synonymous with Black American culture, but it’s also lent its stylings to thug culture, criminal culture, “badassery” culture and anonymizing culture. As an item of clothing, the hoodie does a lot. CBS used a blank-faced hoodie for their series Stalker, to give the impression of a hidden, menacing individual. Another show, Stalkers Who Kill, features a featureless figure in a hoodie, and there are scores of music videos, movies and images to indicate that hoodies are worn for nefarious purposes. Martin’s death is confirmation of that bias. It serves as a constant reminder that we expect the worst from people in hoods. It doesn’t help that stalker is synonymous with hunter, or that it sounds like “stalk her,” nor is it a good thing that hoodies sound close to an urban term for ghetto, the hood, that’s so hood, your hoodrat friends. When the term is used, we expect the worst. We believe in the nefarious. I say nefarious because we are supposed to believe that hiding one’s identity is an admission of guilt. Our world is full of open records requests, fact-checking and Wikileaks. We assume that people trying to hide something are hiding something bad, that they have a secret that is harmful to others and want to avoid making that public. With a hoodie, it’s the same thing. We assume that because a garment anonymizes, it is bad. It removes personality, identifiability, even gendering. Much of the discourse surrounding the burqa applies to the hoodie in this sense – we assume the burqa reduces the wearer to a subhuman form, and we assume that it is worn under duress. There are a lot more gender politics at play with one article of clothing than the other, but the principle, the notion that only oppressed Muslim women wear it, or the idea that only criminals wear a hoodie, stems from the same root point – don’t hide who you are. In spite of this, we’ve given the hoodie a certain level of cool factor. In Tron Legacy, Jeff Bridges walks around in an extremely fashionable hoodie, giving him a certain sense of hippie mysticism. Countless comic book heroes are hooded, or don hoods when their costumes are out of order. Just as we chastise those who wear hoodies for wanting to hide, we can respect when our heroes, our superstars want to disappear. When an actor steps out of their home in a hoodie, baseball cap and sunglasses, we assume it’s because they don’t want to be mobbed by paparazzi. When the hero of the story must disguise himself to escape a situation where he might be recognized, he’s more likely to pull on a hoodie than to don some Groucho glasses. 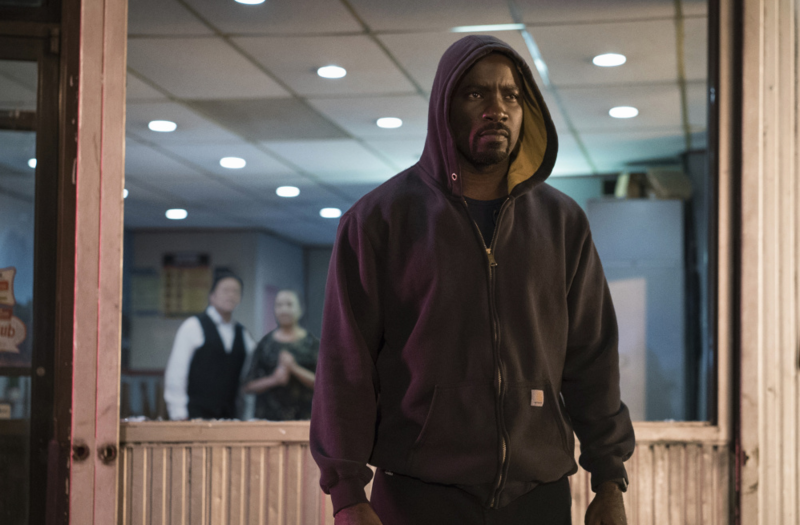 And when Luke Cage steps out onto the streets to deliver justice, he pulls a hoodie on to dish it out. This moment in the series is so purposeful, so delicate and wondrous, I wish I could give it a better exploration than these scant words. But what we are facing in Luke Cage is a bold statement by the artist about black men and hoodies. We’re in Harlem, a Harlem riddled by crime and violence no less, and we’re told that there are absent fathers, a rampant gun trade, and absolute lawlessness on the behalf of the residents there. So when the hero arrives, and arrives garbed in what the outside world would not consider a hero’s attire, it’s a shock. True, Luke Cage gets vilified. True, he is wanted by the police. But not for wearing a hoodie. So much of the show is heavily stylized, so it’s easy to pass over moments where the story doesn’t match up to real dialogue, real feelings, real life. It’s almost unnoticeable, that Luke escapes persecution for wearing a hoodie, but you have to acknowledge that the show creates an absence of negative bias for his clothing. He takes the anonymizing powers of the garment and uses it to strike fear into the hearts of his enemies, not the general public. His hoodies get torn up by bullets and blades, but the man is whole. The sweatshirt is emblematic and reversed – the hero wears the garb of the criminal as his costume, but where the hero cannot be destroyed, the hoodie can. When you watch Luke put on a hoodie, you’re watching him simultaneously become Luke Cage, the Hero, and the Stranger, the Man of Mystery, the Anonymous Force in the Streets of a City. Many have joked that the show’s greatest accomplishment is to play on the fears of white people, that there’s nothing scarier than a bulletproof black man…in a hoodie. To some, it’s laughable, a dark joke at the expense of the hundreds of Black Americans gunned down in our history. But whether you like the joke or not, you can’t deny the point, that there is something unique about Luke Cage. He doesn’t have to stand for the white man’s greatest fear to be the black man’s greatest role model. This is a show, after all, that takes great pains to point out the lack of role models for Harlem’s young men. We, the general audience, love Luke for his constant references to the old school, his appreciation for black tradition, for Black America. But Black America loves him because he can pull on a hoodie and he doesn’t disappear. He becomes larger than life.